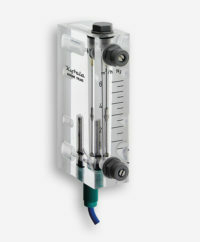 The Kytola Model EA variable area flow meter features an adjustable flow alarm and is specifically designed for liquid and gas applications where continuous flow control is essential. The clear scale on the unit’s machined acrylic body makes it easy to take accurate measurements, and the adjustable flow rate makes it suitable for a range of applications. The Model EA is suited for use in automatic welding lines, heat treatment ovens and similar applications. For special constructions, please get in touch with our team to discuss your requirements.